FAULTY fire alarms sounded across a popular supermarket twice in the last two days but it wasn't the siren that left locals scratching their heads. It was the lack of communication from staff members at Woolworths Bargara. Steve Diver started filming the reaction of customers and staff while the echoing alarm sounded for more than three minutes. He then posted the video on to social media, describing the incident as "organised chaos”. "Love how informative the staff are in an emergency,” he said. False firm alarm sends frustration : A false alarm has left a Bargara man scratching his head. Customers can be seen in the footage going about their business throughout the alarm and Mr Diver said staff gave no directions there was no direction given by staff. He said no one acknowledged the alarm and the only communication from staff was when an employee asked him to stop filming. Two minutes into the recording the evacuation alarm sounds and an announcement is made to evacuate the building. 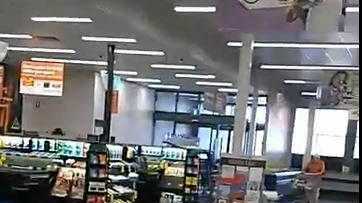 No staff can be seen or heard in the video as customers walk to the front of the building. "I think they should make an effort to make their customers feel more at ease in these kinds of situations,” Mr Diver said. A Woolworths spokesperson confirmed two false alarms were set off at Bargara, resulting in the evacuation of customers and staff. "Our team followed correct fire evacuation procedures to ensure the safety of our customers and team members,” they said.